Records are available for free on the county website or for a small fee at the county office in Washington Court House. 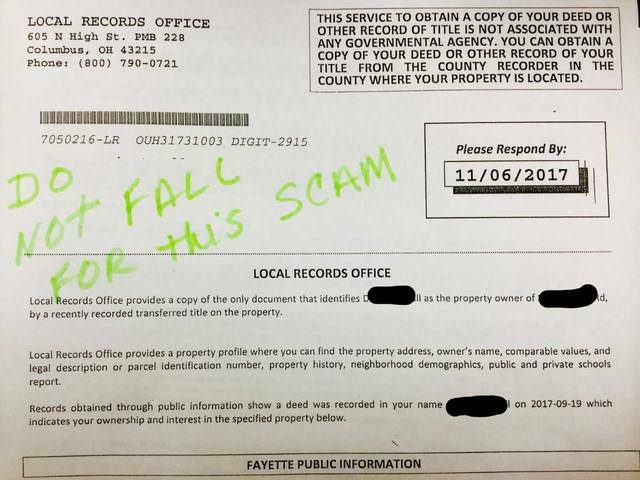 Beware of a “local records office scam” targeting people in Fayette County, says Fayette County Recorder Cathy Templin. Several people in Fayette County have received a letter in the mail, Templin informed the Record-Herald, but the letter is not sent from an official local or state government office. Templin said the letter looks like it came from an official office because it states it came from ‘Local Records Office’ and lists the name and address of the land owner and the date that their land was transferred. Templin said there is no reason for people to spend the $89 because copies of deeds may be obtained for free on the recorder’s website or for 25 cents at the county recorder’s office in Washington Court House. “Their name would appear at the top of the letter. People have brought in the letters to the recorder’s office and asked me if it was real. I have seen three or four of these letters in the last few months. They get them when their land is transferred and even when people refinance they send these out, but it’s a scam. The average person doesn’t understand,” said Templin. The attorney general’s news bulletin said that if you suspect a scam or believe you have been treated unfairly, file a complaint with the Ohio Attorney General’s Office at www.OhioAttorneyGeneral.gov or 800-282-0515.
https://www.recordherald.com/wp-content/uploads/sites/27/2017/10/web1_Scamming.jpgRecords are available for free on the county website or for a small fee at the county office in Washington Court House.